The childhood home of the author Kate Roberts has been taken over by Wales' heritage body Cadw. 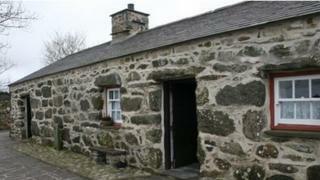 Cae'r Gors, a Grade II listed quarryman's cottage in Rhosgadfan, Gwynedd, was restored and turned into a heritage centre in 2007. The writer, who died in 1985 aged 94, was known as the "queen of Welsh language literature", and her work was widely translated. The acquisition means Cadw now has 129 properties on its books. One of eight children, Roberts lived in the house between 1895 until at least 1910. She later bought her former home and gave it to the nation in 1965. Cae'r Gors was opened to the public after a 10-year campaign, partly paid for with a £656,000 heritage lottery grant. After studying Welsh literature, Roberts was inspired to begin writing following the death of her youngest brother Dei during World War I. She wrote both short stories and novels about trials faced by slate-quarrying families. Perhaps her most successful book of short stories was Te yn y Grug [Tea in the Heather] about children. Of her novels, perhaps her most famous is Traed Mewn Cyffion [Feet in Chains]. Culture Minister John Griffiths said: "The importance of Kate Roberts' literary works to the people of Wales is well understood across this country and internationally. "Cadw will be working closely with the Cae'r Gors Trust to develop the site into a sustainable heritage visitor attraction and place for learning and celebration of Welsh literature."